We finished* the patio! It was a really hard week, as we had to haul up the last, oh, 10,000 pounds of materials during a freaking heat wave. Lots of early mornings, afternoon siesta, then work again in the evening if we could get motivated. Our bright spot: the heat pump, which we bought primarily for heat, is also an air conditioner and it was 72 degrees and 65% humidity in the house while it was 90+ outside (temp and humidity). So breaks were quite refreshing. We went through a lot of popsicles and sweaty clothes, but we have the patio installed, and even finished early enough to sit on it this afternoon. Now the hot tub is heating up so we can go soak our aching backs. Ouch! So many pavers. 153 to be exact, at 40 lb each. *Fine print: We still have to finish a few rock edges, install a step – which will be concrete and stone – on the end with the path to the hot tub, and finish that pesky ramp, but we are about 93% done with the back yard. Yeehaw! Two days later (this took a while): edges cut and soon to be set. Today: sanded and basically set. More sand to sweep periodically as it works in. Dogs approve. 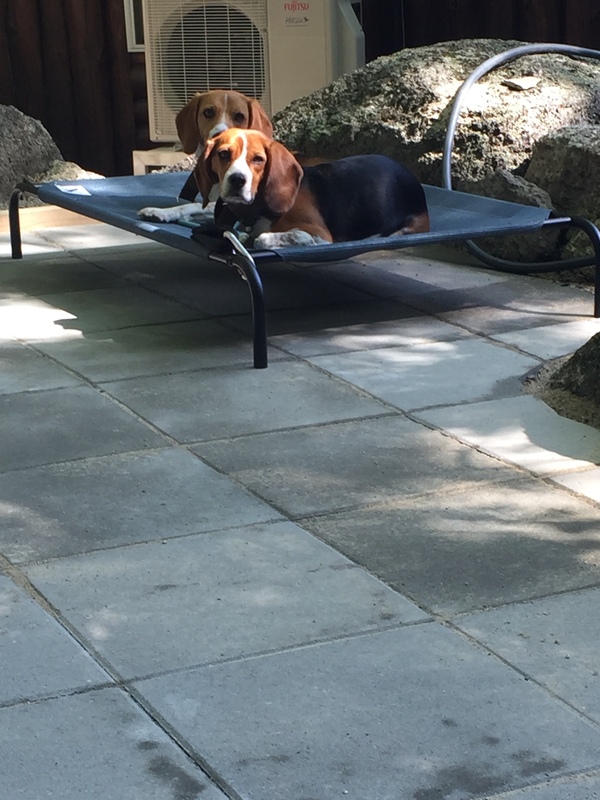 And liked their new patio bed. 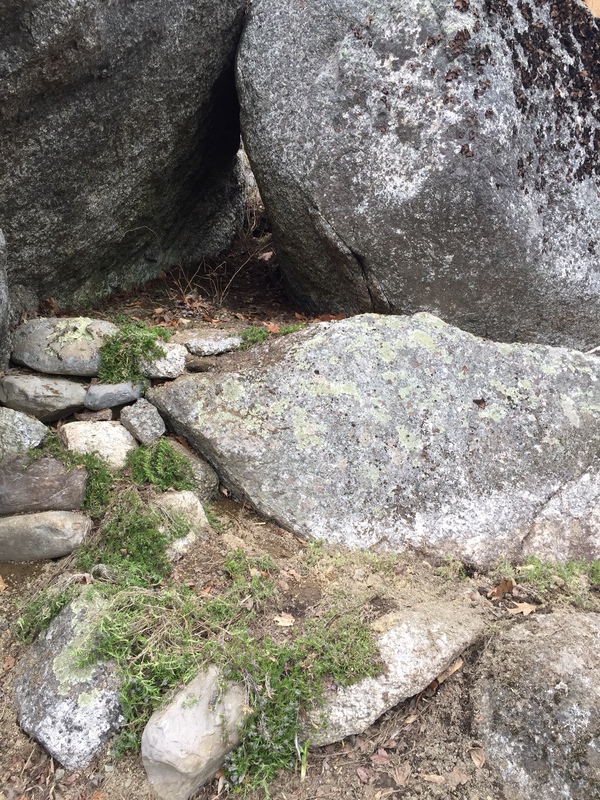 At the end of the patio, there used to be a steep dirt slope onto some jagged, buried boulders and a tight squeeze past a tree stump and a rock. No more! We decided to go with a sloped path (ramp) instead of stairs here because of the awkwardness of the buried boulders. And yesterday, we packed in all the base to make the ramp! Progress. That’s like 12 tons of stuff. What?! No wonder we are so tired and sore. So very glad we have the hot tub to soothe our muscles. And we resurrected the ladder-sled hauler contraption (see: https://youtu.be/bi0deCR-3oI). Otherwise we’d be dead, since it saves us carrying buckets of stone up 23 stairs. But hey, it’s really coming together! We’ll be BBQ-ing by the Fourth of July…maybe? Little help, anyone? Site prepared and drainage in. Ready for gravel! A small amount of gravel in. Tons to go. And gravel is done on this end! Woo hoo! And this end is finished too. One of the big rocks had to be moved from the heat pump installation, and now was the time to get it out of the way by incorporating in the patio edge. We’re building a ramp for access to the patio. Much better than the pointy rocks and dirt mess before. Stairs were not going to work here. Using cinderblocks to give some structure/stability to the ramp base. And we can’t get a compactor to the site (nor afford to rent one for the month this is taking), so yeah we’re hand-tamping too. We will have Thor arms by the end! As you can see in the photos of the ramp (where we’re filling now – almost done?! ), the patio area was originally way out of level – there was more than 18″ or so of drop from the high to the low end. We left 6″ fall in place for drainage – a hair more than recommended for this length – and now the access point is about a foot higher than it already was! 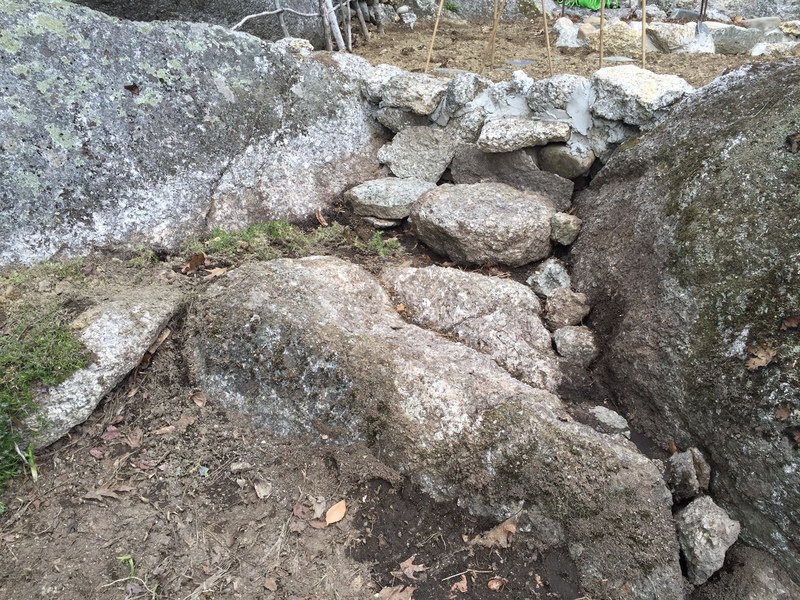 So we’re creating a sloped ramp – because of the iceberg-like rocks in the walkway area, we couldn’t do stairs here, but are filling in all around the rocks. With any luck, the ramp base will be done this weekend, then on to stone dust and pavers, then a party on the patio! Last November’s garden by the driveway is doing well. And some pretty petunias from Mom added to the garden by the cellar. We rebuilt these charming terraces and started filling them in with dwarf tickseed, speedwell, and Russian sage in front of the gray birches. This stump…after a lot of digging and hacking, we’ve called in a stump grinder. Argh! This Mugo pine will go where the stump is to finish off the garden by the front stairs. Next week. And out back, even more rebuilding of formerly lovely, but abandoned/neglected terraced gardens around the patio. First, chopping out old beeches. Set a level line to figure out the wall height. We had already moved a couple of hostas here, otherwise just mess. Et voila! Two terraces here, filled with ferns, hostas, heuchera, and perennial geranium – nearly all were moved from elsewhere. To the left of this set of terraces, we significantly rebuilt the wall that had basically completely toppled over and was a condominium for chipmunks. We did that one today, and have no pictures yet…but it’s looking really nice, and houses my collection of columbines. Here are a few of them – they are especially stunning now, all in bloom. I have a work trip this week, but KJ plans to start on the rock steps that lead to the back yard. 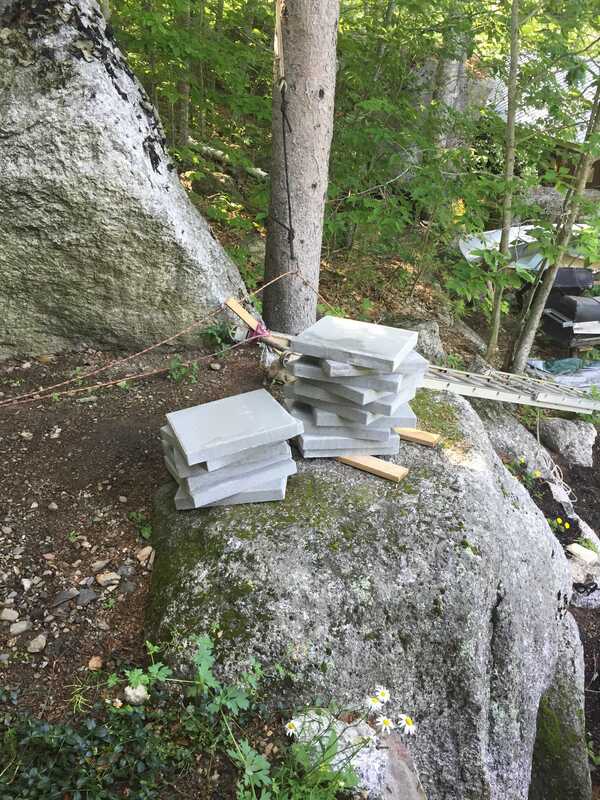 Luckily we have more rocks than anything else here, so no shortage of materials. We are stoked! And warmer. Or cooler, depending on the season. Something will be installed here. Guesses? It’s been a tough couple of months, with some sad news about family and dreary weather to boot. Spring has never been more welcome, and it finally seemed to arrive this weekend. Getting outside and into some gardening (which here has a lot to do with rocks) was just what the doctor ordered. 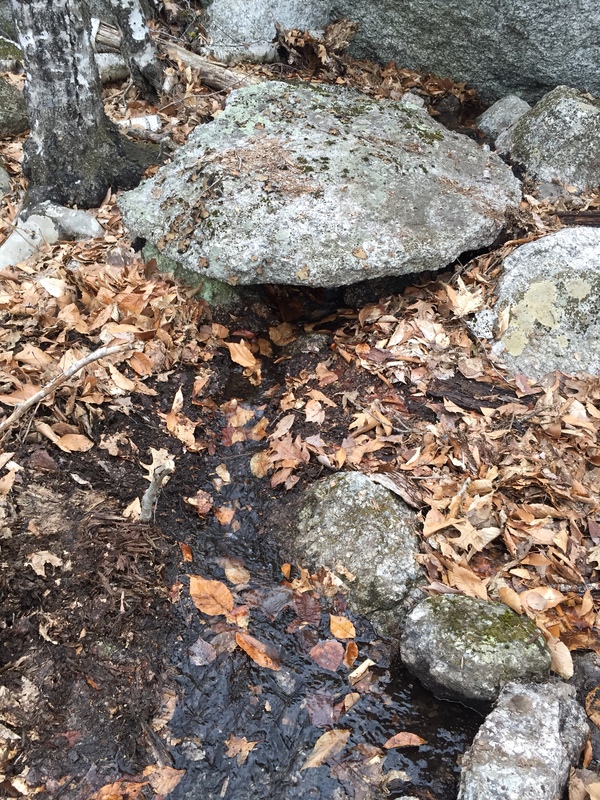 Here are a few early spring projects that have gotten us going; we have a lot more planned for this summer and look forward to more time outside the cabin. Peepers! Boy are they loud out there at night, and this little guy liked the back door. One of my gray birches is budding! The second, sadly, was destroyed by an over-excited beagle and her crazy leash antics. One of my sets of Solomon’s Seal is back. Fingers crossed the other one pops up soon. Super-exciting: the hobblebush we sourced from the woods and transplanted seems to be budding too! And the Sanguinaria made it too! Its beautiful flower closed before I could snap a photo. Second, jobs of spring: we renovated a couple of fallen/overgrown beds. 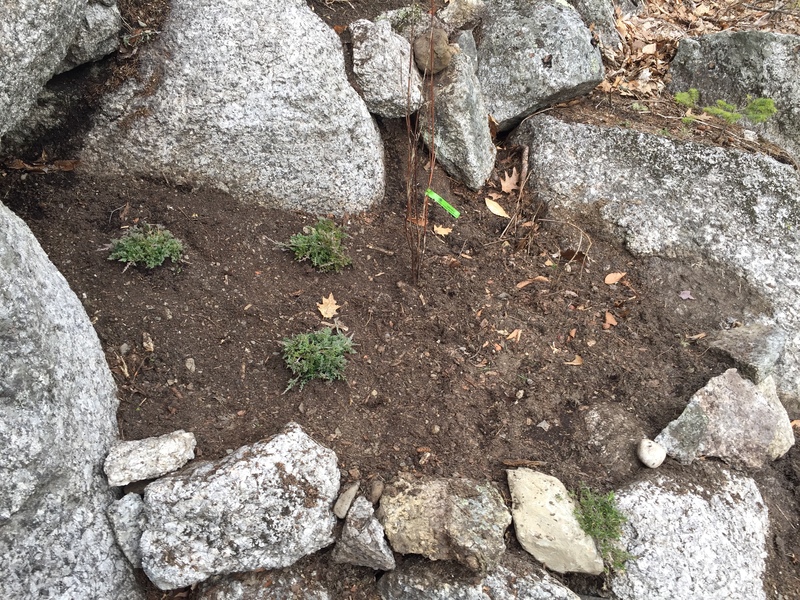 Near the back of last year’s new veggie garden, there was a tangle of lilacs on a rock. We scraped it clean, added a new set of steps to access the cucumber patch, and planted in more creeping phlox rescued from the road ditch, which is scheduled by the town to be completely redone this year. We also tidied up the rock garden immediately to its left, and moved those lilacs to the far end of the cave seen here, so they can hold back the soil next to the porch. And smell pretty too. We also rebuilt a small bed to the right of the stairs, where rocks had tumbled off and left a mess anchored only by a sad red osier dogwood and a false honeysuckle rescued from the ditch on the other side of the road last year. We bought a few humble junipers to fill in the back and hold the slope, and will get some perennials to fill the front, hopefully when Mom & Dad come to visit in a few weeks. Greenhouse field trip! Finally, we checked out the small mess of intermittent water tumbling in from the upper end of the property and coordinated some of the flow that previous owners had running through a wrecked old pipe – now it runs under this great natural stone bridge rather than creating a giant soppy leaf pack all over the back ‘valley’ under the leaves. More rock & gardens to follow as we continue to work our way around on the weekends until work lets up. We are really looking forward to getting out to do some landscaping and gardening this summer, with priorities in the back yard and some smaller projects out front. As we were thinking about the back yard, I realized that last year, every time I wanted to pop in a plant or snag a weed, I had to run through our around the house, down 25 steps, and to the garage to grab my trowel or weeder and gloves. Barring adding a shed out back (which we don’t want to do), it seemed that having a stash of simple tools would be ideal, so I looked online for old mailboxes, thinking I could install one that would look window-box-like under the bathroom window, in easy reach. 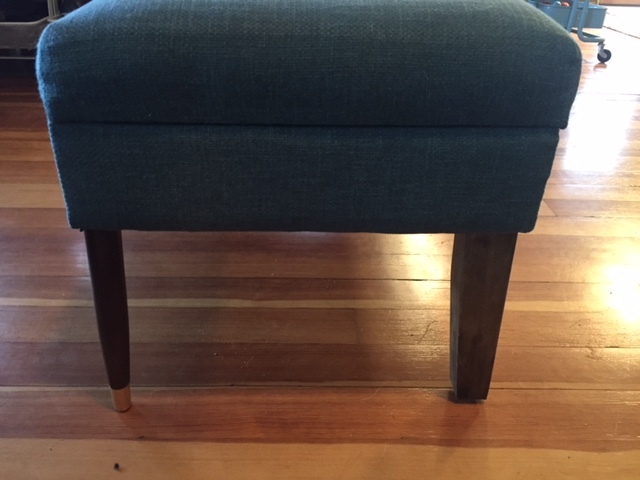 Most of the ones I liked on ebay or etsy were a fortune – but I found this gem for under $20 and the seller worked with me to reduce shipping to a reasonable amount. And it’s absolutely perfect – exactly what I was imagining, and old galvanized, beat-up mailbox from a farm in the midwest. We cleaned it up and clearcoated it to keep any additional rust from forming, mounted it, and popped in some new tools and a pair of gloves my Aunt sent me last fall. Now we’re ready, whenever the sun wants to come out. It has been looking like this outside. We love the tiny door on the side! All the tools fit great. But for now, this is the only “garden” growing. We are behind on posts, but we’ve been working away at a bunch of tiny projects – the kind that live on the punch list until everything more fun is done, and you can’t ignore them any more, and it’s still to cold to garden. So here come a few posts about insignificant-seeming projects that nonetheless make our space a nicer place. First off, the ceiling in one corner of the kitchen where all the leftover evils gathered: the uneven underside of the loft floor, a flying beam from the bedroom wall, the open top near the bathroom fan that we weren’t sure we were ready to close in. It wasn’t really visible as it was above a small kitchen cabinet, but needed to be closed in nonetheless. Enter some leftover log slabs, a 1/4 sheet of whitewashed plywood (this was new to us, like this but 1/2″ thickness), and some patience as we made a zillion cardboard templates since the shape of everything was crazy. Somehow I didn’t get any before pictures. Note new clamps! I had an old un-used Groupon for Rockler and we remembered to stop by when we were on mini-vacation a few weeks ago. They work great! Just ignore that hole in the wall – it was where we were going to put a fixture until we found the cabinet. Luckily the cabinet covers it :). Everything in, and caulked the edges. Just needs final touch-up at this stage. Finished! I’m not sure anyone else will notice, but I feel better. Still winter, still weird weather – hot, cold, ice, snow, rain, ugh! Not so easy to do big projects. 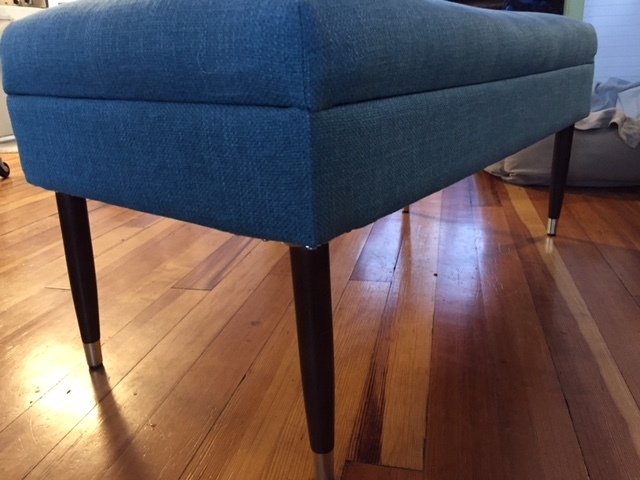 So, another little one: I’ve wanted to change out the legs on our fairly generic Target storage benches that make up the ‘dining room’ banquette forever, and finally found two sets that are close enough matches and the right length on ebay. (Set two in the mail now – they look like a match, so fingers crossed). Today I grabbed new top plates (brackets) for them, and installed the first set. Thank goodness new plates are still made for the exact same thread pattern. 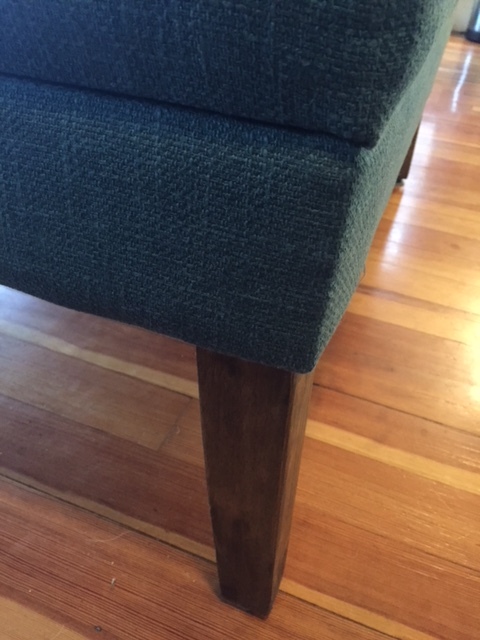 The new-old legs are so much more classy! Witness: before, so blocky and really poorly made/finished. And after, so chic! And solid. Nothing like vintage – you get good quality with the right feel. And the side-by-side comparison. No contest. Stay tuned for more cabin-fever fun!